Rob Bell in his book Love Wins addresses one of the most curly issues of faith – heaven and hell. Bell asks the question, would a loving God send people to eternal torment forever? Bell puts hell on trial, and his message is quite hopeful. Eternal life doesn’t start when we die – it starts right now. Really? Bell has attracted a lot of criticism about this book and his overall theme of universalism – the belief that all people will eventually be saved, given enough time. 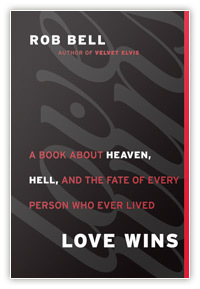 There are a lot of reviews, good, bad and very ugly about what Rob Bell has to say about heaven and hell. It seems to me that most of the people who claim that Rob Bell is a heretic are the same people who have never read his book. Finally, here’s a video clip about Rob Bell’s book (by Rob Bell), view it, read the book and then judge for yourself.